Hydraulic Fracturing of Shale rock to release natural gas is a very hot potato politically at the moment. In Manchester and Salford there have been mass-protests against a company called iGas that are carrying out experimental drilling at Barton Moss in an attempt to see if the area is viable for fracking. Indeed, former Happy Mondays dancer and Celebrity Big Brother winner Bez has joined the protest at Barton Moss. The chemicals used in the process of fracking include lead, uranium, mercury, radium, methanol and hydrochloric acid1 and activists worry that some of these chemicals will escape the bedrock and make it into the water table and therefore into the aquifers that supply our drinking water. In the United States, where fracking has already started, people have posted videos of being able to ignite water coming from their taps and this has been blamed on fracking, see this clip as an example. The process of fracking requires 72 trillion gallons of water per well2. That’s an awful lot of water that has to come from somewhere and be transported to the fracking site, causing pollution in the process. Some claim that fracking causes earthquakes but any seismic activity is likely to be less than that caused by conventional mining3. Experts believe that the amount of shale rock under our feet could heat our homes and provide energy security for one hundred years4. Some Government advisers also believe that fracking could help reduce our environmental footprint as the process produces less CO2 than coal. Each method for generating electricity has its own issues so I will now take a look at the pros and cons of each in turn. Coal is the oldest method we use to generate electricity. Electricity is generated when negatively charged atomic particles called electrons are attracted to a positive charge. This is achieved by spinning a large magnet within a coil of conductive material (copper) – forcing electrons to jump from the magnet to the coil. To spin the generator shaft, coal is first crushed into fine powder then ignited in a furnace. Pipes of cold water pass through the furnace and the water is converted into pressurised steam that turns a turbine that is connected to the shaft. Like any fossil fuel, as supplies become sparser, the cost of extraction becomes higher and the price will increase. Another way that coal fired power stations are aiming to reduce CO2 emissions is investment in technology called carbon capture whereby instead of releasing carbon dioxide into the atmosphere, it is stored underground. The cost of converting old power stations to use carbon capture and storage technology will mean that the cost of producing energy from fossil fuels will increase in the future. Like coal, natural gas is a non-renewable source of energy. It is estimated that worldwide, natural gas will run out in the 2070s7. In the United Kingdom, much of our natural gas is supplied by the north sea gas reserves but production has been dropping since 19998 as our reserves run out. The BBC estimates there are only 30-40 years worth of supply left9. In the meantime, we will be force to import more and more gas from other countries. Relying on gas from other countries makes us more vulnerable to price hikes on the open market. There is also the issue of energy security as alternative sources of gas come from countries such as Russia and the Middle East. Russia currently supplies 30% of Europe’s natural gas10 and in 2005 a dispute with Ukraine lead to the pipelines being turned off resulting in price rises in Europe that affected the UK. Britain and other countries have stated their disapproval over the current situation in the Crimea but Russia holds all the cards with its Siberian oil and gas fields. Any sanctions against the Russians are likely to hurt our economy more than theirs, even if we get our gas from other countries, when the global supply chain is reduced the prices go up everywhere else. During two world wars, German forces tried to starve Britain into submission by blockading ports and destroying merchant vessels but all Russia would need to do is turn off the taps to Europe and we would not be able to defend ourselves unless we do something about our reliance on gas. 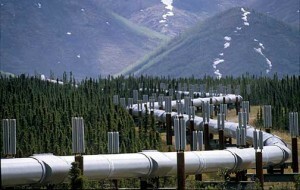 The pipelines would also make a very attractive target for ambitious cyber terrorists that could target the computer systems that control the supply pipelines. The production of electricity from Nuclear power stations works pretty much the same way as for coal and gas but instead of burning fossil fuels to generate the heat to convert water into steam, nuclear fission is used instead. Nuclear fission is the process of firing a neutron at a radioactive atom (Uranium in this case) which causes the atom to split, generating huge amounts of heat in the process. 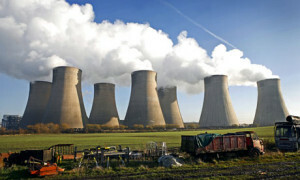 Unlike when burning fossil fuels, very little carbon dioxide is produced in the process of generating nuclear power. Nuclear power is extremely efficient, according to the Nuclear Energy Institute, One uranium fuel pellet creates as much energy as one ton of coal or 17,000 cubic feet of natural gas11. Uranium isn’t renewable but it is a very common element and is plentiful in supply. 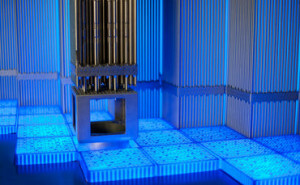 Spent Uranium fuel rods remain radioactive for 10,000 years and give off heat for many years so it needs to be cooled and monitored way beyond its life as a fuel. Building nuclear power stations and dealing with contaminated waste is incredibly expensive and controversial. There are currently 9 Nuclear Power plants operating in the UK, most of which are expected to be decommissioned by 202312. In order to attract companies to build the Hinkley Point C nuclear power plant, the government has had to agree a deal to purchase the electricity that will be generated for £92.50 per megawatt hour – almost double the current rate14. This increase in cost will have to be absorbed by energy consumers. One of the biggest concerns about Nuclear power is safety. There have been two major incidents involving nuclear power plants. 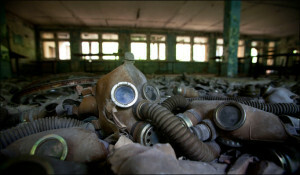 In 1986, the Reactor 4 of the Ukrainian Chernobyl Plant suffered a meltdown after an experiment to test a new safety mechanism for cooling the reactors in the event of a shut down. The disaster killed 28 people through Acute Radiation Sickness15 and is attributed to 4000 additional cancer deaths over the lifetime of those exposed to the radiation. In fact, radioactive particles that escaped into the atmosphere have reached as far as the United Kingdom, with Cumbria particularly affected with a 12 fold increase in occurrences of thyroid cancer16. In 2011, a massive earthquake and tsunami caused a major disaster at the Fukushima Daiichi nuclear power plant in Japan. In this case, there was no reactor meltdown as the reactors were successfully shut down but to keep a reactor stable, large quantities of water are pumped through the reactor core to prevent overheating. The cooling system pumps are powered by electricity normally provided by the power plant but the tsunami cut off the power supply. Nuclear power stations have diesel generators designed to kick in and keep the cooling system working when the conventional source of power fails but Fukushima’s generators were also washed away by the tsunami. The reactors began to overheat but scientists managed to pump sea water into the reactors but eventually a number of small explosions and fires occurred. Since the incident, a massive amount of water has been pumped through the reactors to continue to stop them from overheating but this contaminated water is radioactive and needs to be stored indefinitely. The Japanese have built numerous large storage tanks to contain the massive amounts of radioactive water but there have been a number of incidents where radioactive water has leaked out and escaped into the pacific ocean. Greenpeace estimate the cost of the Fukushima disaster to be 250 billion dollars18. If a similar accident was to occur in Britain, a small island with a population density of 660 people per square mile19, the consequences do not bear thinking about. Eventually, non-renewable sources of energy will be used up and we will have no choice but to rely 100% on renewable sources. By 2020, the EU target is to produce 30% of our energy by renewable sources20. Renewable energy also has a much lower carbon footprint but it has its own problems. Every other method of electricity production can be scaled up or down to meet demand but you cannot force the wind to blow. In fact, when wind speeds are too high, wind turbines have to be disabled to prevent them from being damaged. We do not yet have enough technology to store excess energy generated at times of high supply and low demand for times of high demand and low supply. In Argyl, Scotland there is a hydro-power plant that can supply large amounts of electricity for a short period of time to meet peak requirements. Situated in a hollowed out mountain called Ben Cruachan, the Cruachan power plant takes water from a reservoir situated at the top of the mountain and allowed it to flow through channels inside the mountain itself. The flowing water turns turbines to generate electricity. During times of low demand, power from the national grid is used to pump water back up to the reservoir from Loch Awe, at the bottom of the mountain. 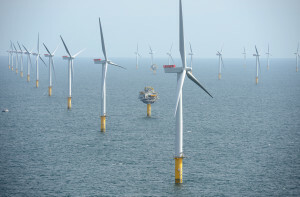 Energy generated by wind farms could also be stored by converting the electricity into pressurised air or gas that could then be ignited at a later stage to convert it back into electricity but this technology is in its infancy and will need significant investment if we are to achieve 100% renewable energy. Some protesters claim that wind farms are an eyesore that spoil the natural beauty of our countryside. There is also a risk to wildlife as natural habitats make way for the giant turbines. The turbines are expensive and cost a lot of money to maintain so renewable energy also comes with a hefty price tag. It may surprise you that we consume less energy now than we did in 197021. However, with the population expected to rise and with the continued electrification of our transport networks i.e. electric trains, trams and motor vehicles), I expect that our electricity requirement will increase but successive governments have failed to act fast enough to address our energy needs. There is no single solution and there is no magic bullet – no matter how we generate electricity, there will be controversy and debate. Coal is cheap but it’s dirty. The gas market is highly volatile. Nuclear power is efficient but high risk and expensive and renewables are clean but unreliable. Fracking could provide security in the short term but we do not know what the long term effects would be. My biggest concern about the energy market is a lack of honesty, information and debate about the issues in parliament. There is a very real danger that restrictions will need to be placed on energy consumption as power stations are decommissioned before they have been replaced. We do not want to cut corners when it comes to building nuclear power plants in order to get them online in time to plug the energy gap. The cost of electricity has soared over the last decade and it is only going to climb at a sharper rate in the future. Fracking may be a cheaper solution and I think we will reach a point where the demand for affordable energy outstrips the environmental concerns about fracking. The UK government has often accused Russia of corruption but many of our politicians have a vested interest in the energy market. For example, the chairman of Cuadrilla, a company that has requested a license for fracking is a member of the Cabinet Office. More information about the links between our government and the fracking industry can be read here. I personally believe that in the interests of democracy, no politician or government adviser should be allowed to have any other business interests other because even if no corruption has taken place, MPs leave themselves open to the speculation of such wrongdoing. 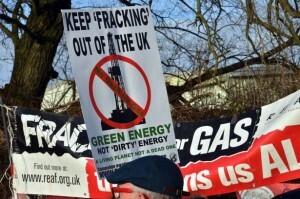 With regards to the question of whether or not we should entertain fracking, I think it could divert concentration away from researching more sustainable longer term energy solutions, even if the consequences of that decision could be power shortages and sharp inflation, I think we should take a long term approach and reject fracking but we need to be very honest about what that means for our future.